With the vast selection of tanning lotions available on the market these days, the average consumer is left in a haze. From which type of lotion you should use, navigating past the knock off versions that mimic the real stuff. We have gone through years of experience using many indoor tanning lotions to know which is the real deal. What is tanning lotion? Why do I need it and does it really work? Tan Asz U LUAU 200X Island Black Bronzer – 13.5 oz. 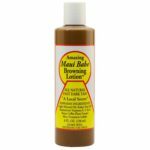 Hempz HYPOALLERGENIC DARK TAN Maximizer – 9 oz. 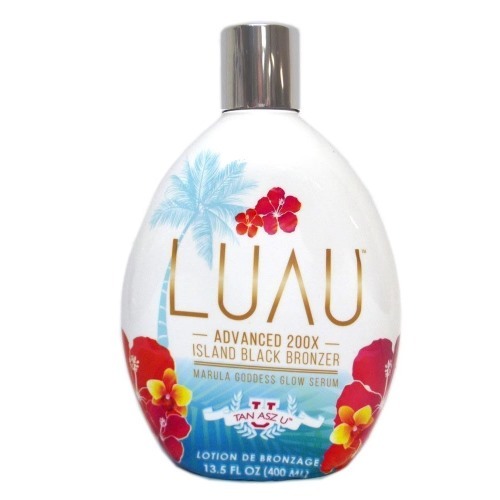 The minute you start using the Tan Asz U Luau 200X Island Black Bronzer you will realize how amazing this lotion really is. It has a great texture, which makes application smooth and easy. Once you get in the tanning bed the lotion readily starts to work in browning your complexion. It has been observed to tan your complexion in as little as 10 minutes, however color will vary relatively with persons of different skin types. Regardless, users will see results in the first tanning session. It’s made with marula oil, a long list of tropical island fruit extracts and laced with the scents of Awapuhi peach. This simply means it provides concentrated moisturizing effects for your skin during tanning, leaving it feeling soft and glowing all while making you smell great! The downfall: Tans Asz U Luau 200X Island Black Bronzer has intense pigmenting ingredients and absorbs pretty quickly. The color of the lotion has a brownish hue and when applied with your hands will stain your skin. As soon as you’re done applying the lotion, just wash your hands right away to avoid semi-permanent, residual bronzer from lingering on your palms. 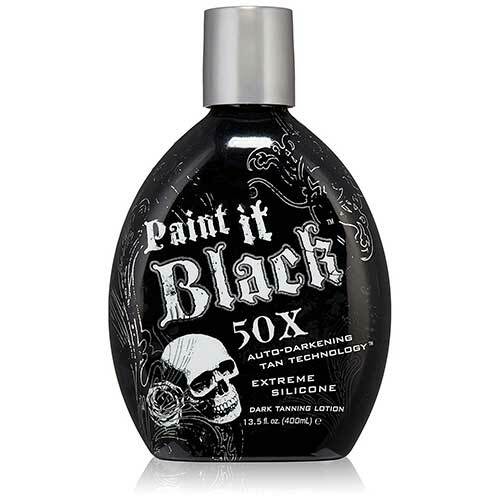 The best buck for your money comes in this bottle of Millennium Tanning Paint It Black 50X and we will tell you why. First off, it’s priced very nicely compared to other, similar tanning lotions. 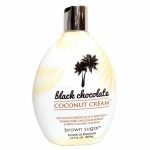 It is specially formulated for indoor and outdoor tanning, so no need to spend on an additional lotion for separate occasions. With its super effective 50X darkening capabilities, we have observed instant tanning of the skin during sun exposure and continuous darkening some time after. It gives your complexion a stunning dark bronze color and with the extreme silicone emulsion blends delivers silky, soft and smooth skin after every use. There are a bunch of skin nourishing ingredients to note, some of which includes aqueous infusions of tropical extracts and oils in addition with vitamin A, which encourages healthy skin cell production ultimately firming and tightening your skin and vitamin B, which makes the skin soft, youthful looking as it diminishes wrinkles. 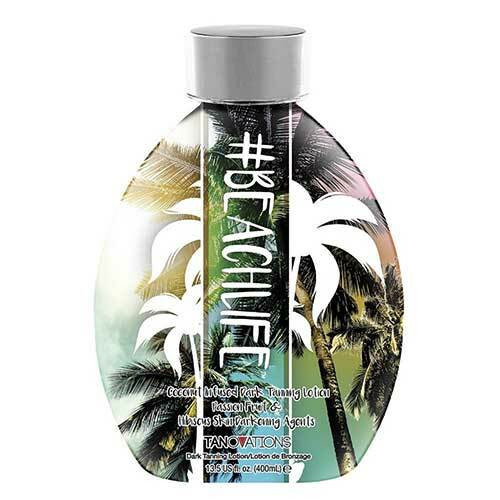 It’s a triple-acting tanning product, working as an accelerator, bronzer and skin restorative moisturizer. 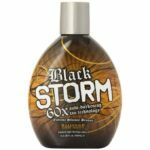 It has a terrific scent of cotton blossom fragrance in the bottle, upon application and even after tanning, so don’t worry about that awful burnt smell you get after coming out the tanning bed. The downfall: The Gothic themed black bottle with that scull image at the base has been perceived to be a bit daunting! Now that we’ve gotten that out the way, persons with sensitive skin have complained of experiencing a reaction after using this lotion, so if you’re unsure of the effects it will have on you, perhaps you should do a patch test first. Others with ultra pale skin have experienced gradual tanning results opposed to one time skin darkening. Also, some of the fella’s aren’t quite fond of the girly smell that springs from this lotion. 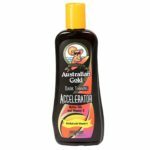 The Australian Gold’s name already speaks volumes as a quality tanning lotion brand. 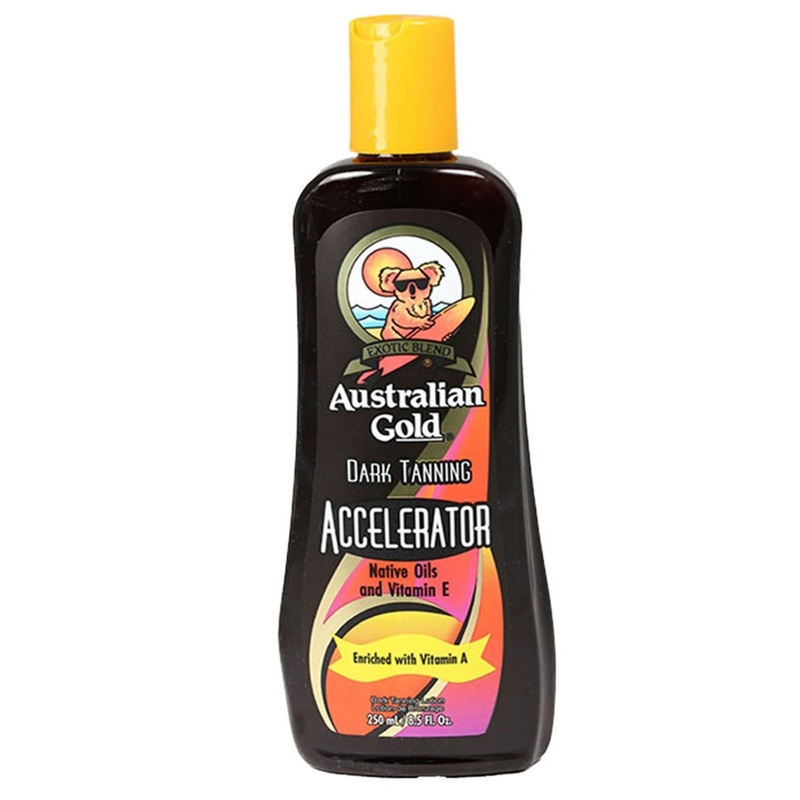 So its no surprise the Australian Gold Dark Tanning Accelerator Lotion made our top pick for tanning accelerator. 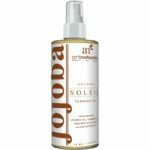 It is by far the most effective of its kind, speeding up the tanning process up to three times faster than natural tanning and leaves you with a terrific brown tan. It can be used for indoor and outdoor tanning and helps to both establish a base tan and maintain your tan for a longer time. It has an exclusive biosine complex formula that is infused with a rich supply of vitamins A and E along with other essential nutrients and moisturizers to keep your skin hydrated, conditioned and feeling soft and smooth. This aids in stimulating melanin production for deepening and darkening your skin color in record time. Additionally minimizing UV exposure and reduces the chance of burning especially since there is no SPF protection. It has a great scent too, labeled with having ‘cocoa dreams fragrance’, or in our opinion, a light tropical smell was more detectable. The downfall: There are quite a few reported cases of persons having an allergic reaction after using this lotion, please do a patch test before applying on your body and especially your face, which is more susceptible to breaking out. This may partly be attributed to traces of paraben found in its ingredients. The Hawaiian Tropic Dark Tanning oil acts a super moisturizer during tanning, making your skin supple to achieve optimum and lasting color. It guarantees a deep, dark glowing tan once used properly. Prep your skin by exfoliating and moisturizing before visiting the tanning salon then apply generously all over your body, massaging the oil deeply into your skin. 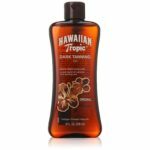 This Hawaiian tropic oil formula is enriched with skin-nourishing antioxidants that are found in fruit extracts of papaya, mango, guava, cocoa seed butter and aloe leaf along with coconut, mineral and eucalyptus leaf oils. You will find the scent exudes hints of coconut and banana. The texture is thick and slick and as such has a lot of staying power, effectively coating the skin so that it retains high levels of moisture during your tanning experience. The downfall: This tanning oil is heavily based and extremely greasy, as such is bit difficult to wash off. Despite having a great scent, it is short lived because it wears away pretty quickly after application. Additionally, there are disadvantages with products containing mineral oil such as this one. Mineral oil, even though has skin nourishing qualities, acts as inhibitor for your skin to breathe and its natural ability to absorb moisture and nutrients. Another favorite comes from Ed Hardy’s BeachLife tanning lotion. 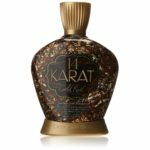 This multifaceted formula works for both indoor and outdoor tanning and is compact with darkening intensifiers to deliver a dark golden skin color without the use of bronzing agents. It’s designed to maximize the absorption of UV rays for tanning yet provides elevated protection of tattoos. 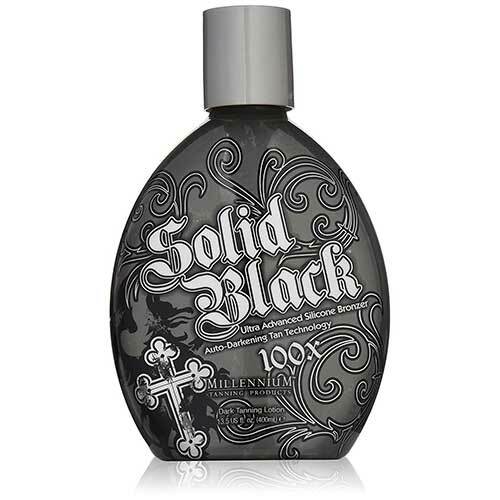 This brand of tanning lotion is one of the best we have found to truly safeguard your ink, extending the color and brightness. BeachLife has great skin revitalizing components too, these are aided by ingredients such as seaweed extracts, and hibiscus extracts plus vitamins A and C. All these nutrients provide a large scope of skin benefits, some of which reduces the appearance of cellulite, increase elasticity, promote firmness and youthful looking skin. There is also coconut milk and coconut oil added that gives your skin lasting hydration and softness and your tan unfailing darkened results. Application is relatively easy, even though the lotion is white it absorbs well and turns clear, however it does take much more rubbing action. It is of medium consistency so gives great coverage to arrive at an even looking tan. Another perk you can enjoy is its terrific tropical fruity smell that lingers all day. The downfall: While BeachLife made our top pick for one of the best indoor tanning lotions out there; don’t expect to get all sultry and bronze looking in one go. It takes a couple tanning sessions to get what we categorize as a gorgeous-looking tan. But when the right tan is accomplished, there is no doubt you will be pleased with the color. Almost everyone who has used Hempz Tanning will concur that this is a one of a kind lotion. Its lightweight formula is an excellent skin fortifying conditioner that hydrates, nourish and moisturize your skin like never before. We have found that it produces soft supple skin that stands the test of time with extended use. We even recommend using as a moisturizer even if you’re not seeking tanning results. However, expect a superb golden color and dark tanned complexion with its dark tanning blends and enhancers when used under the tanning bed. The lotion preps your skin by moistening and softening the upper layers so that it elevates the tanning process to achieve darker color dimensions and in a quick time. There is natural calming extracts of oatmeal to help soothe your skin during and after exposure to the UV rays as well as rich blends of 100% pure natural hemp seed oil and mango seed butter to hydrate and smooth skin for a more radiant looking glow. It’s great for those who have sensitive skin issues and want a dramatic tan without the hassle of nursing rashes and hives after tanning. 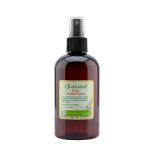 Its hypoallergenic formula is non-greasy, paraben free, gluten free, nut free, THC free and 100% vegan. The downfall: Many sensitive skin users still found this lotion to be irritable, so we can’t urge you enough; if you have super sensitive skin, please do a patch test before full body application. Also, because it is lightly fragranced, there were complaints of no scent but this is expected with lotions that are hypoallergenic since added fragrances can cause skin irritation. 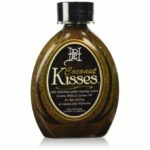 Coconut Kisses is one the best quality tanning lotions simply because it has a great texture and smell and does a terrific job of bronzing your complexion for a long time all while keeping it hydrated and moistened during the tanning process — it gets all the ticks with high ratings. 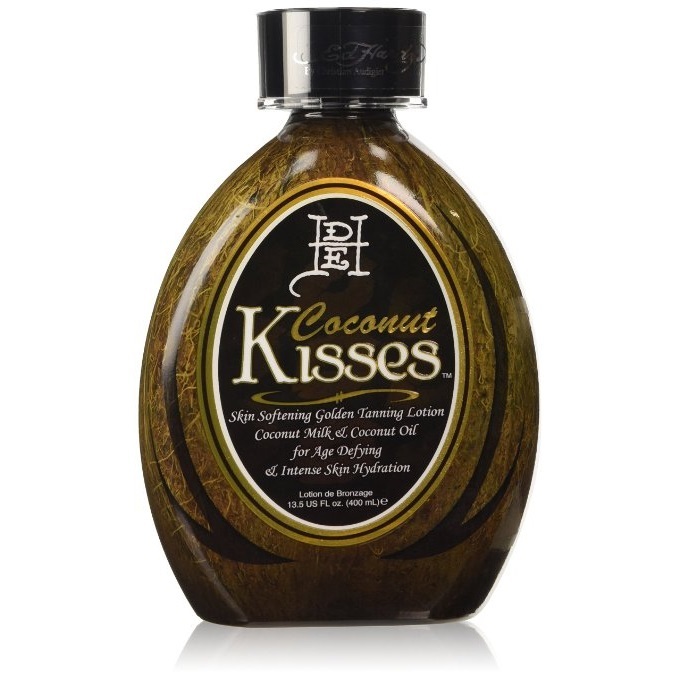 Its not called Coconut Kisses for no reason, this bottle of tanning lotion has high concentrations of coconut milk and coconut oil for an extreme softening and skin oxygenated effect when applied to the skin. There are elevated levels of tanning intensifiers combined with its unique ‘quad tyrosine blend’ of melanobronze, melactiva and nouritan which all work together to stimulate and optimize melanin formation and lengthen the life of your tan. Its Bodyfit feature stems from ingredients such as cocoa seed butter, safflower seed oil, lemon and banana fruit extracts to name a few, which help to reduce the appearance of cellulite and promote firmness. The lotion is thick and goes on nicely to give you maximum coverage, there are bursts of a floral and coconut aroma, which makes you want to drench your body with this lotion. We have seen rich bronzed results after two indoor tanning sessions on a level 6 bed. You also want leave the lotion on for an additional 2 – 4 hours after tanning so that it continues to develop and darken your skin. The downfall: A few users didn’t feel this lotion gave them significant tanning results, but we believe that without proper prepping and knowing how to use this lotion then you will not reap the full benefits it has to offer. Also, there are quite a few knock off versions of this Ed Hardy Coconut Kisses tanning lotion, so beware of those fake products that may find themselves in your mail. It has a great and apparent fragrance of Orchid blush, which smells absolutely fantastic. There are some great ingredients consisting of walnut, pecan, hemp and carrot seed oils and a bunch of fruit extracts plus melanin for intensified pigment coloration. Even though it’s highly spiked with bronzing agents, we’ve never had any issues with streaking or weird, uneven coloration. The lotion has a great texture that goes on smooth, which helps in the overall application to attribute in consistency in your tan. The downfall: Beware, this Millenium bronzer will stain your hands if you don’t wash them right after application. It’s not waterproof either, so if you happen to start sweating underneath your clothes, there is slight chance you will experience color transfer on whatever you’re wearing. There were some users who complained about arriving at orange looking skin, but to avoid this problem select a lower level tanning bed when using lotions containing bronzers. Whether you choose to use this tanning lotion indoors or outside, it’s sure to make you feel like you’re somewhere on a beach. It gives you a terrific sun kissed glow reminiscent of one you’d get from sitting out in the sun on a hot summer day. The scent is described as having the aroma of Tantini, not sure what that actually smells like but overall we give this lotion a thumbs up for having a great tropical smell. There are some potent tanning intensifiers bunched with natural bronzing additives to not only give your skin a bronzed color but does this after about 15 minutes in the tanning bed and 40-60 minutes in the sun depending on the sun’s intensity on that day. It provides a very good source of moisture as well, infused with coconut and walnut oils, buckthorn berry and aloe-vera leaf extracts to name a few – you will experience soft feeling skin with every use. It has a silky texture that goes on smooth and laced with a bit of shimmer to brighten up your skin to make you glow. The downfall: Some users reportedly broke out in hives and raised bumps after using this product. The best place to perform a patch test is on an area where you are susceptible to experience an allergic reaction. For example, if you usually break out on your back, place a bit of lotion on a small spot there for a day and see how your skin responds. 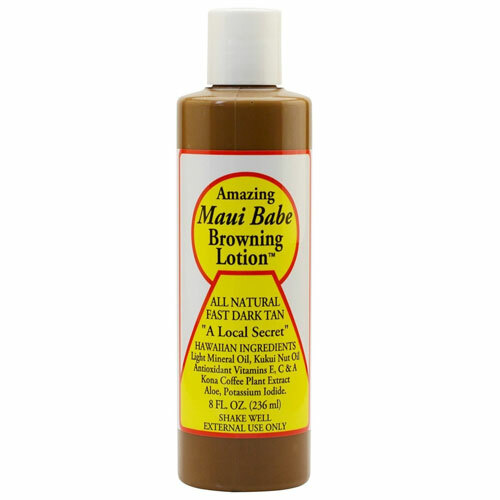 Maui Babe Browning lotion is one of our top picks for the simplicity and effectiveness of its tanning formula. Its best used for indoor tanning however can get a bit messy but it accelerates your tan to a beautiful sun kissed glow. The lotion is colored so it functions as a guide during application for good, even coverage. This also helps to minimize the appearance of unsightly streaks and a blotchy looking tan. This Hawaiian tanning formula if free of many harsh substances, which makes it primed for sensitive skin users as well as fair skinned individuals that require more UV exposure as this can also cause skin irritation. However the lotion is quite thick and has mineral oil, which is known to clog your pores so light application should be employed. You are guaranteed results when using this lotion, especially when used correctly. Use higher-level tanning beds and lay out for about 15 minutes per session. Skin type 1 through 3 will see a tanned caramel hue while darker skin tones – skin types 4 and 5, will experience darker skin color transformations. The texture is of medium consistency and rubs in smooth like butter and will leave your skin feeling soft and moisturized. Some of its ingredients include kukui nut oil, kona coffee plant extract, aloe vera along with vitamins A, C and E and a bunch of antioxidants. It smells great with aromas of coffee and nut. The downfall: First off, terrible bottle design. 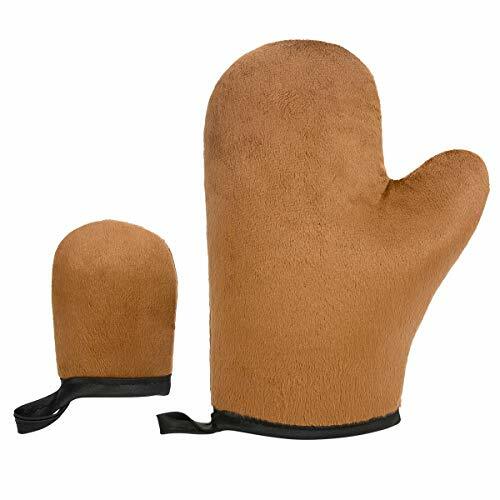 The lotion is brown colored and even though it washes off easily, will get on your towel, swimsuit and hands. So a good tip is use wet wipes to clean your hands before hopping into the tanning bed. A tanning lotion is used to speed up the the tanning process. Also referred to as indoor tanning lotions, they are designed to maximize the effect of the sun’s UV ray’s on your skin. So how does it so this? In simple terms they help promote melanin production in your skin. Melanin is produced after your skin has been exposed to ultraviolet rays. Melanin is what gives your skin the darker appearance. Tanning lotions increase the melanin which is brought to the top skin layers by increasing blood flow to the areas they are applied. The indoor tanning lotions you find on the market are deigned to be used in a tanning bed or booths which use artificially generated UV rays to mimic the suns natural light. When compared to the traditional suntan lotions or sun blockers that people use outdoors, tanning lotion are subtly different. The main difference is that these lotions do not cause any damage to the materials the tanning beds are made of, which is most commonly an acrylic material. These beds can be damaged by a regular tanning lotion. There are also specific tanning lotions available for outdoor use but you are advised not to use these when you are tanning indoors. You can however use lotions that are designed for indoor use, outdoors. 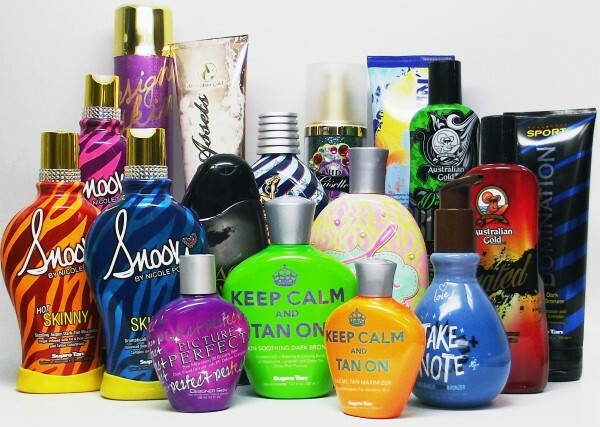 It is important to note that many of these tanning lotions do not contain any form of SPF, or offer any sort of protection from sun exposure. This is why it’s recommend that you use some form of sunscreen in addition to your tanning lotion so that you avoid sunburn. You must always re apply both the tanning lotion and sunscreen according to the manufacturers instructions. This is usually every few hours. It is important that you remember your skin type while using tanning lotions as you may have fair, medium, light, dark, olive or deep skin. You can find out your skin type by using what is known as the FItzpatrick scale which is a easy way to identify your skin type. More information on that can be found here. In addition to your skin type, you also have to consider what you are trying to achieve from your sun tanning and use a suitable lotion to meet these goals. 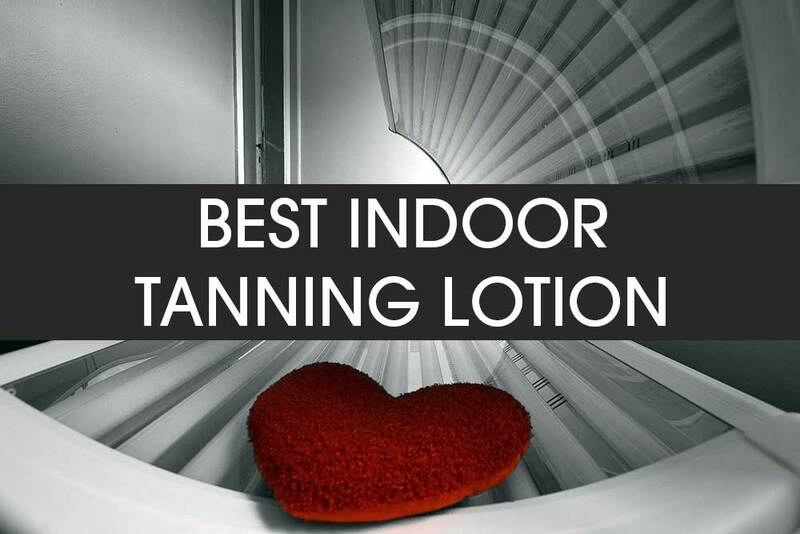 You can choose between bronzing lotions, accelerators, moisturizing lotions and much more. While it’s up to you to make your choice, do ensure you choose something that is designed with your skin type in mind. Whichever tanning lotion you choose to use, for best results, you need to apply it about 30 — 60 minutes before you start exposing yourself to UV rays. You not only have to evenly apply it on your body, it is highly recommended that you exfoliate your skin some point before you apply the lotion to achieve the best tanning results. If you do not have someone to help you apply the lotion to those hard to reach places (such as your back) it is recommended to purchase some type of applicator to help you do this. Accelerators are made of vitamins and oils which help increase your skin’s melanin production. Most accelerators also contain some sort of moisturizer. Products with accelerators can be very helpful to achieve your desired tan in the shortest period of time. Maximizers are meant for people who already have some form of a base tan, and who are just looking for a darker tan. These maximizers don’t contain much of a moisturizer; they are created to ensure your skin responds quicker to the UV rays to help give you a darker and richer tan. Tingle or hot action lotions are to be used by more experienced tanners. These lotions contain ingredients (such as Benzyl Nicotinate) that offer the benefit of increasing the blood flow and micro-circulation to your skin to produce a deeper color of tan. Firming ingredients are designed to help boost the collagen and elastin levels in your skin in order to tighten your skin. This is perfect if you are looking for a product which not only tans but also firms up your skin. It is well known that keeping your skin well moisturized is one of the most important things you can do for your skins health. A good time saving solution is to look for tanning lotions supplemented with moisturizers. Moisturizers are essential to hydrate your skin and keep it looking as good as possible. In addition to this, it also helps keep your skin smooth and silky to touch. Aloe Vera is also effective at keeping your skin hydrated by keeping your skin moisturized with its natural healing and cooling properties. It is especially helpful in providing relief if you have spent too much time in the sun! There are tanning lotions containing other additives and ingredients which are designed to help your tanning experience. Most are just gimmicks and any scientific proof of their effectiveness is limited. Other times they are just included to give the tanning lotion a nice scent.